USED TO BE I sometimes carried my infant son in a backpack when I went flyfishing. The photo shows one such instance back in 1979. Now 32 years later, he is bigger, stronger, and sometimes even smarter than I am. That’s what I think about on Father’s Day; not so much about a particular day, but rather fatherhood as a continuum. 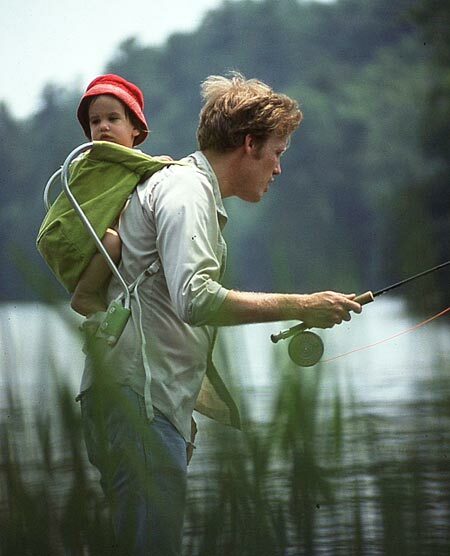 There has always been fishing in it somehow, this fatherhood thing, but it’s never been the most important part. On a recent extended-family trip to Florida and when the fishing didn’t amount to much, the most fun I had was in playing with my young granddaughter. She came along with her father, namely my son and the kid in the backpack. My own father, had he not died last year, would have loved it. Eventually, it was time for us all to go for dinner as arranged by my son at some flossy restaurant. He looked at me and told me I had to tuck in my shirt. “It’s that kind of place, Dad. You got after me for years to tuck in my shirt. Now I’m telling you: Tuck in your shirt.” So I did. Such is fatherhood.